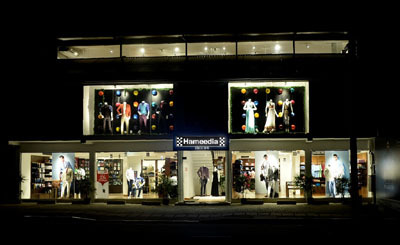 Hameedia has brought its special kind of magic and unique brand of clothing to its thousands of customers in and around Pelawatte with the recent opening of the Hameedia Showroom at No. 486, Pannipitiya Road, Talangama South, Pelawatte. This store also goes on record as being Hameedia’s first-ever purpose-built eco-friendly outlet and has a whole range of environmentally friendly features. Its solar power net metering system has modern LED light fittings and harnesses sunlight to a great extent. In addition, a system of rainwater harvesting has been put in place, while biodegradable bags are being used instead of polythene bags.